A new start-up called Ourspot will offer a service for couples and close friends to privately share links, thoughts and other content with each other. The intention is to create a shared online space that also serves as a document of a relationship. Ourspot launches to beta testers today. Not to zoom out too far, but let me set up a bit of context for why I think Ourspot is interesting. Services like Facebook, Twitter and Pinterest can turn sharing into a performance. As compared to emails and private messages, which have clearly intended recipients, posting something on a social network changes the nature of sharing because of the possibility that a larger audience will see it. But there are other benefits to using social tools — they have increasingly pretty layouts, they can compile a record of our activities without much effort, and they have nice mobile apps. And so Ourspot wants to be a social-style sharing site for the people we share with the most — our significant others and perhaps our closest friends. Ourspot pages are generally designed for two people, and intended to be cultivated over time. Users can share photos, links from around the Web, and notes to each other. The “spots” can be private or public. For better or worse, your “spot” is only as good as the work you and your partner(s) put into it. Ourspot does overlap quite a bit with things that are already available. For instance, the Ourspot layout looks a lot like the style- and product-sharing site Pinterest — one of the more influential Web designs in recent memory — with tiles of pictures and other posts. 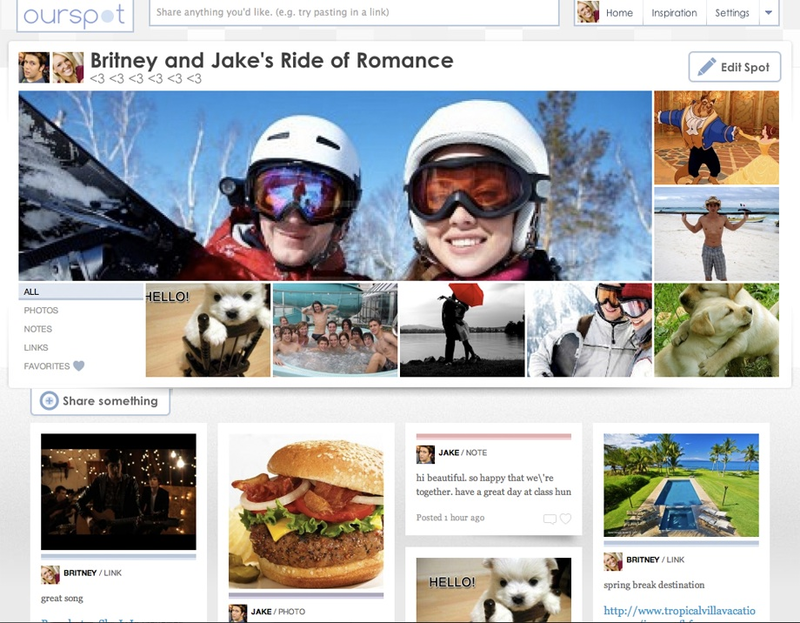 Ourspot also features a user-chosen cover photo, like the new Facebook Timeline. But Pinterest doesn’t even allow private boards. And we all have had our trials and tribulations with Facebook’s privacy settings and ever-expanding networks of acquaintances. Ourspot is perhaps more like the personal-journaling app Path, which encourages users to share only with their closest friends and family. However, Path is focused more on users’ original content captured through its mobile apps. Ourspot is currently Web-only, with an iPhone app in the works. It was built and bootstrapped by Sam Yam and Ruven Chu, who together also created a white-label Groupon-esque service called ChompOn.